Imagine if your website went down while you were sleeping peacefully. During the night, Googlebot crawls your website, checking it regularly, and finds the site is down. It keeps getting no response, again and again. So Google eventually decides that your site is no good and you wake up and make an unpleasant discovery. Instead of being in the top ten, you are now God knows where, and can’t fathom out why on Earth this has happened. Google is not as downright merciless as this – it does make allowances the first few times – but if the bot cannot access your website over a prolonged period of time, it will ruin your search rankings, you can depend upon that. Say, you have been in the top ten for a while; you are popular and things are going fine. Then, at some point, customers find your site is frequently down and for long periods. What is their response? They will go away and never come back. So, as a result, you lose your profit. All because your web hosting provider was trash and you were unaware of it. Most web hosting providers promise 99.9% of uptime and continuous performance. However, not all of them actually stand by their word. No provider admits they have uptime issues, as this means they will receive complaints, handling problems, refunds, and so on. It is impossible for a website to be up 100% of the time, simply because some planned downtime is both normal and healthy. However, when it is scheduled, downtime is a calculated risk, and when it is unscheduled, it leads to losses. New, inexperienced users often don’t even realise they have a problem unless they purposely check their website’s uptime – most are perfectly positive that it works all right all of the time. But it is not just newbies who are affected. Larger businesses have neither the time nor the desire to dig into these details; the only essential thing for a website is to stay alive and be profitable. Ten minutes of downtime isn’t exactly a blessing for larger, more powerful companies, but it can prove more of an inconvenience for some smaller businesses. It is all about the negative impact that downtime has and the profit loss it can cause you, no matter how large or small your company is. 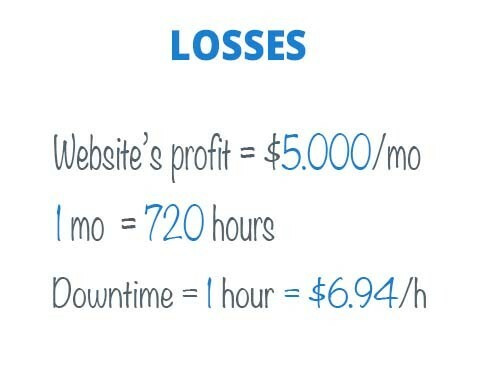 Let’s have a look at the cost of downtime for a company’s website that brings in $5.000/mo on average, for instance. We can easily see that 1 hour of the site’s work equals $6.94 approximately (if we take a month of 30 days). This is either $6.94 of profit (if the site works) or $6.94 of loss (if it is down). Now, let’s figure out how much you actually lose, depending on how much downtime you have. 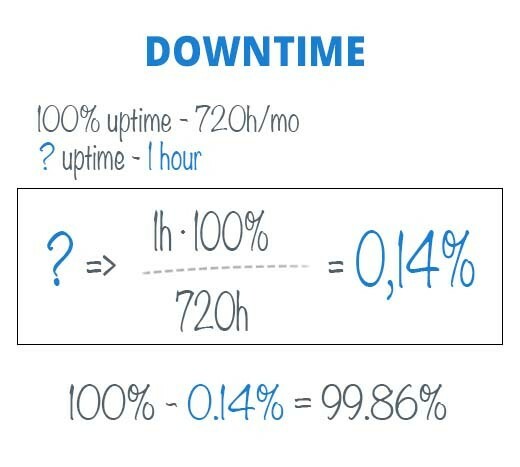 The idea of uptime seems clear, but the percentages we see are often misleading. It is easy to understand that 99.99% is better than 98.87$ or 99.92%. But based on these figures only, you can’t say for sure how long your website was down. In order to make things simpler, let’s calculate how much downtime there is in 1 hour for an average 30-day month. If 1 month equals 720 hours and our sought downtime equals 1 hour, we get a very simple proportion that shows us there is 0.14% of downtime a month. That’s exactly the percentage you should take into consideration when you are faced with the web hosting provider’s uptime statistics. For instance, if your web hosting shows there was 99.86% uptime for a given month, you need to know what that means in terms of your losses. You can simply calculate that 100% – 99.86% = 0.14%. That’s how much downtime you have a month. When you take into consideration that 0.14% is 1 hour, then you have 1 hour of downtime a month. Thus, if 1 hour of your website’s work is $6.94, and all of this hour is ineffective, you are likely to lose $6.94. $6.94 – that’s how much you can pay for just two months of hosting with some providers. And that is what you are losing while paying for yours. It, therefore, makes better sense to take a look at some other offers (and to be fair, they are in abundance on the Internet at the moment). A better and more consistent web hosting provider will prove a safeguard against any loss of traffic, customers and profit. Why choose an unreliable provider if there are perfectly dependable ones out there? So it is best to make a bit of an effort and find one (and it is not necessarily expensive; that’s the beauty of it). Not all expensive web hostings are good, neither are all reliable hostings expensive. Some of the large, popular companies are very good, others less so. There are also plenty of quite small, unknown enterprises in the industry that (according to our monitoring results) offer a much better and more efficient web hosting alternative, even though you may not have heard of them before. To be on the safe side, is it better to enable all of the available options to make sure the hosting you are using is OK. There is plenty of software and lots of online uptime checking tools that can give you an idea about the current state of things and notify you immediately about any downtime, should it occur. You could start with the most popular ones – UptimeRobot, Pingdom, Site24x7 – or any others you find suitable. It is a useful tool to have at hand, as it will enable you to be at least aware of the situation and to improve it sooner. Find a perfect provider that is relevant to your needs. Check the performance of web hosting providers. Check your personal domain and Shared IP performance. Again, our monitoring scheme is quite different from the ones you have probably seen on the Internet. The uptime statistics on the provider review pages represent an average drawn from ALL of the hosting Shared IPs’* data for a given period (since December 2016), and not just ONE Shared IP*, where we have one or two of our personal projects hosted. Our principle is based on deduction – we sum up all the collective data that we get and draw an average for the uptime, rather than base our conclusions about general web hosting performance on the results of one website (and one Shared IP). You can actually trace back your provider’s general performance and your Shared IP’s* particular performance and get a very clear idea, not only about the current situation, but also how it has actually performed in the past. Our statistics are, therefore, much more representative and trustworthy. You are welcome to come and check them for yourself. “50 and more domains rule” means that we take only Shared IPs starting from 50 domains and more – it allows us to cover the maximum number of Shared IPs (~98%) and to provide the most reliable uptime information. We have data about ~150mln websites. We check which web hosting provider they belong to on a daily basis. However, there are only ~12mln websites that comply with our “>50 domains” rule. And these are the ~12 mln websites that we ping daily for their uptime and response time.